This is a one page activity that has sentences with simple sight words. 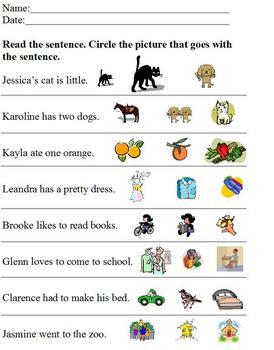 Students are to read the sentence and circle one of three pictures that shows what is happening in the sentence. This requires comprehension of simple sentences with basic structure. This is an excellent resource for students with special needs to work on in an inclusive setting. The objective is to identify the main idea of a sentence by circling the picture representation.